A lot of people mistake investors for entrepreneurs. Not everyone who buys a million dollar franchise is an entrepreneur. A lot of times, franchisees are people with money who see an opportunity to create an additional stream of revenue. For an entrepreneur, it’s typically less about the money, and more about the need to create and build something. It’s about a vision you have of your life and what you do with it. Sure, entrepreneurs and investors share a lot of the same characteristics; determination, business savvy, and the willingness to take risks. But investors (at least, good investors) play it by the numbers. It’s all about the dollar for dollar return on their work. For an entrepreneur, it’s different. Obviously entrepreneurs need to look at the financial side of whatever adventure they decide to go on, but it’s less about the dollar for dollar amount and more about the need to do something you’re passionate about. Because we entrepreneurs tend to follow our hearts more than most, we can sometimes spend months, or even years, struggling to get by as we build our audience, perfect our systems, and refuse to give up, even when the numbers tell us we should. 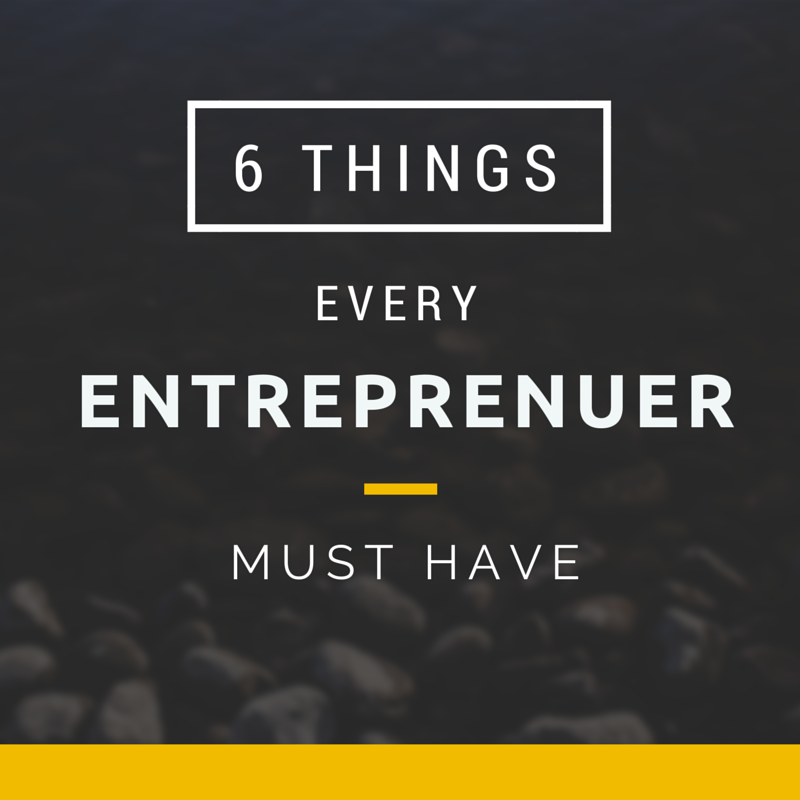 Because of this, there are 6 things I believe every entrepreneur must have. You need to know where you’re going. If you’re an investor, where you’re going is easy; where the money is more than what it is now. For an entrepreneur it needs to be more. You need to know exactly what your life is going to look like, not necessarily how much money you’ll have, but what you’ll have build and what that will mean to you and your family. Creating and building a business is tough. No one has the ‘no-fail guide to entrepreneurship’ so you’re learning as you go. You’re going to fail, and then you’re going to fail again. You need to have a laser focused determination to break through barriers, pick yourself up, and continue on when most would throw in the towel. The world changes.. a lot. If you’re not ready to adapt to the situation, your entrepreneurial adventure is going to come to a rough stop very quickly. Keep your focus on your vision and figure out how to get around the latest hurdle. Entrepreneurs need to be top-notch problem solvers. Not just in the sense of solving your customers’ problems, but solving your own as well. Once you’ve started a few businesses like I have, and once a few of them have failed, a lot of your family and friends will wonder if you’re crazy or stupid for trying again. Although their worry may come from the heart, it can make you doubt yourself and doubt whether what you’re trying to do is worth all the sacrifice. This is where your passion comes in. If you’re truly passionate about what you’re doing and what you’re trying to build, negativity won’t bring you down. In fact, your passion can destroy that negativity and inspire others to follow you. I can’t stress enough how important relationships are. Your most important resources are the people you can turn to for advice, honest criticism, and support. Finding the right circle of like-minded entrepreneurs who know how your mind works is extremely important. Beyond that, creating and maintaining relationships with people opens doors to places you may have never considered going. In 2009 I was given the opportunity to teach at one of the top universities in Ohio, even though I did not have a college degree. The relationship I had built with a professor there, and his need to lighten his workload a bit, lead to 2 years of instructing college students whom all had more formal education than I did. That is an experience I never dreamt of, and one I’ll never forget. And it has opened doors and created opportunities I may have never been offered if not for that relationship. The most important thing to remember is, when you build a relationship, build it with the person, not with the potential opportunity. Be real. Be honest. And always be looking for ways to help the other person out, even if they haven’t helped you yet. I’ve always said, “I’ve been very fortunate to have failed a lot.” This confuses a lot of people who don’t necessarily understand the mind of an entrepreneur. Failure is scary to most people, but for an entrepreneur there is no better training or education than a failure. You can read every book ever written, ace every exam in college, but until you’ve built something on your own and watched it fall, you won’t fully understand what it feels like to fail. More importantly, you won’t know if you have what it takes to stand back up, learn from your mistakes, and put it all back on the line for your dream. This is not a concept that most people understand. In fact, most people would consider this crazy, or even stupid. But for an entrepreneur, failure is not only the most effective form of learning, but also the most effective form of motivation. The majority of the world’s greatest entrepreneurs tell stories of that day they hit rock bottom. That moment when most people would have quit, but when they decided to make the one change, or set of changes, that transformed their life and their business and ultimately lead to their success. Your vision will lead you. Your tenacity will carry you through hard times. Your flexibility will allow you to adapt to any situation. Your passion will inspire others to take the ride with you. Your network will open doors to opportunity. And your failures will give you everything you need to succeed.